Soluri, Banana Cultures. Front cover. All rights reserved. © 2005 by the University of Texas Press. Soluri, John. “Altered Landscapes and Transformed Livelihoods.” Chap. 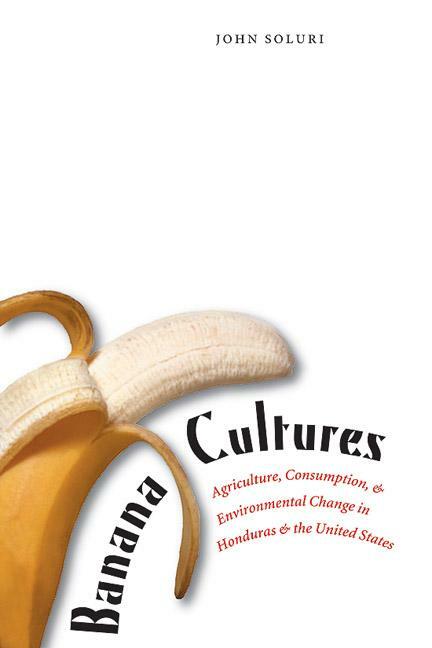 3 in Banana Cultures: Agriculture, Consumption, and Environmental Change in Honduras and the United States. Austin: University of Texas Press, 2005. Bananas, the most frequently consumed fresh fruit in the United States, have been linked to Miss Chiquita and Carmen Miranda, “banana republics,” and Banana Republic clothing stores—everything from exotic kitsch, to Third World dictatorships, to middle-class fashion. But how did the rise in banana consumption in the United States affect the banana-growing regions of Central America? In his lively, interdisciplinary study, John Soluri integrates agroecology, anthropology, political economy, and history to trace the symbiotic growth of the export banana industry in Honduras and the consumer mass market in the United States. (TUP website text). In the featured excerpt, Soluri traces “the dynamic intersection between landscape and livelihood” (75), as it develops in accordance with shifts in, inter alia, local populations, the activities of US fruit companies and the organization of banana production on Honduras’ North Coast. John Soluri is associate professor of history at Carnegie Mellon University.